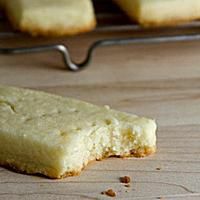 While the holidays are a perfect excuse for a batch of shortbread cookies, these crumbly, melt-in-your-mouth treats are great anytime. This classic shortbread recipe comes courtesy of Kevin, from the blog Closet Cooking. 2. Mix the flour and salt in a small bowl. In a large bowl and using an electric mixer, cream the butter and sugar together until light and fluffy. Reduce the mixer speed to low, and beat in the flour mixture to form a dough. 3. On a lightly floured surface, roll out the dough into a rectangle (about 1/4-in thick). Cut into 3 strips, and then each strip into 6 equal pieces. 4. Arrange the pieces on a baking sheet(s) lined with parchment paper. Bake until lightly brown, 8 to 10 minutes. 5. Transfer the baking sheet(s) to a wire rack and let cool for 2 to 3 minutes, then transfer the cookies to the rack and let cool completely.